Heat oven to 350°F. In 12-inch nonstick skillet, cook bacon over medium-high heat until crisp. Remove from skillet; drain on paper towels. Reserve 1 tablespoon drippings in skillet. Add chicken to skillet; cook over medium-high heat about 4 minutes, turning once, until golden brown. Stir in carrots, onion, thyme, salt and pepper; cook 4 to 5 minutes or until chicken and vegetables are browned. Drain well. Remove chicken from skillet. In ungreased 13x9-inch (3-quart) glass baking dish, mix sausage, beans, tomatoes, bacon, carrots and onion. Top with chicken thighs; cover with foil. Bake about 45 minutes or until juice of chicken is clear when thickest part is cut to bone (180°F) and vegetables are tender. 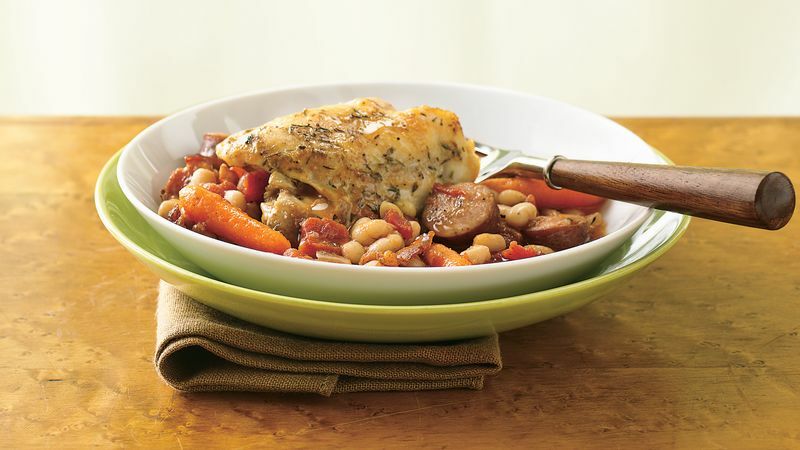 Great northern beans can be used instead of the navy beans.